Guidance Residential received warm endorsements from numerous community leaders at an imams' conference focusing on contemporary financial issues March 1-4 in Houston. The conference explored real estate-related questions such as taking out government loans to buy a home and buying short-sales and bank-owned homes. Guidance Residential was a silver sponsor of the conference. 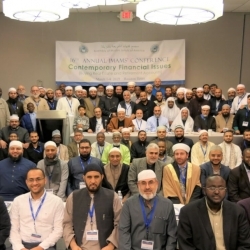 Reston, VA, April 01, 2019 --(PR.com)-- www.guidanceresidential.com/press-releases/guidance-residential-co-sponsors-muslim-jurists-conference -- Guidance Residential received warm endorsements from numerous community leaders at an imams' conference focusing on contemporary financial issues March 1-4 in Houston. Imams and students of Islamic knowledge gathered from across the country to delve into topics including homebuying at the Assembly of Muslim Jurists of America's 16th Annual Imams Conference. The conference explored real estate-related questions such as taking out government loans to buy a home and buying short-sales and bank-owned homes. Guidance Residential was a silver sponsor of the conference. In October 2014, AMJA declared Guidance's home financing program as being permissible from a Shariah-compliance perspective. Guidance is encouraged by the continuous Imam support. "There were so many imams that gave us testimony," said Southwest Regional Manager Faye Safi, who represented Guidance at the conference. "They thanked us for our services and they want us to grow and help more families own homes." "I was very proud to represent Guidance Residential and work for this company," she added. "The primary focus is to support our community and their Islamic Home financing needs. Our presence just reinforces our relationship with the community and the imams. It was a pleasure being a part of this great weekend." Guidance Residential is the leading provider of Islamic home financing in the United States. Since its inception in 2002, Guidance Residential has funded over $5.0 billion in Islamic home financing contracts. Guidance Residential is a subsidiary of Guidance Financial Group, an international company dedicated to serving the market for Islamic financial products and services. Guidance Financial Group offers unique investment products to institutional investors and financial intermediaries worldwide, and provides financial services to its retail customer base in the United States. The company's commitment to intensive research and development and solid operational support for its products has allowed it to develop unique financial solutions that address unmet needs of the American Muslim market. Guidance Residential's proprietary Declining Balance Co-ownership program is trusted as a Shariah-compliant home financing program in the U.S. Islamic finance market. The Declining Balance Co-ownership Program received the highest rating by The Assembly of Muslim Jurists of America (AMJA). Guidance Residential was awarded the 2018 Vanguard Award by HousingWire. Guidance Residential, LLC, (Nationwide Mortgage Licensing System No.2908), 11107 Sunset Hills Rd, Suite 100 and 200, Reston, VA 20190 is licensed by the Department of Business Oversight under the California Residential Mortgage Lending Act (413-0427); Alabama Consumer Credit (22410); Arizona Mortgage Banker (0923408); Arkansas Mortgage Banker-Broker-Servicer (112069); Colorado Mortgage Company Registration; Connecticut Mortgage Lender (18263); Delaware Lender (022090); District of Columbia Mortgage Dual Authority (MLB2908); Florida Mortgage Lender (MLD656); Georgia Mortgage Lender (17286); Illinois Residential Mortgage Licensee (MB.0006455 11107 Sunset Hills Road, Suite 100 and 200, Reston, VA 20190; MB.0006455-001 100 East Roosevelt Rd, Units 44 & 45, Villa Park, IL 60181) licensed by the ILDFPR, James R Thompson Center (JRTC), 100 West Randolph Street, 9th Floor, Chicago, IL 60601, 888-473-4858 (General), 844-768-1713 (Banking Div); Indiana DFI-Mortgage Lending (37408); Kansas Licensed Mortgage Company (MC.0025178); Kentucky Mortgage Company (MC361158 & MC361566); Maryland Mortgage Lender (12927); Massachusetts Mortgage Lender (ML2908); Michigan 1st Mortgage Lender, Broker & Servicer Registrant (FR-0941); Minnesota Mortgage Originator (MN-MO 20320419); Mississippi Mortgage Lender (2908); Missouri Company License (18-2428); New Jersey Licensed Lender (9933648); New York - Licensed Mortgage Banker - New York Department of Financial Services (B500726) (NY location: 171-21 Jamaica Ave, 1st Floor, Jamaica, NY 11432); North Carolina Mortgage Lender (L-112542); Ohio Mortgage Broker Act Mortgage Banker Exemption (MBMB 850079.000); OregonMortgage Lender (ML-4145); Pennsylvania - licensed by the Pennsylvania Department of Banking, Mortgage Lender (21050); Rhode Island Lender License (20163318LL); South Carolina BFI Mortgage Lender/Servicer (MLS-2908); Tennessee MortgageLicense (109274); Texas SML Mortgage Banker Registrant; Virginia Lender Licensee (MC-2138) licensed by the Virginia State Corporation Commission; Washington Consumer Loan Company (CL-2908); West Virginia Mortgage Lender (ML-36038); Wisconsin Mortgage Banker (46355BA).